Lady Luck is always on your side at Holiday Inn Club Vacations at Desert Club Resort Las Vegas, and purchasing a timeshare resale through SellMyTimeshareNow.com is always your best bet. We have a number of Desert Club Resort resales and rentals available at up to 70% off the retail price! What’s My Holiday Inn Timeshare Worth? Holiday Inn Club Vacations at Desert Club Resort truly offers the best of both worlds. Located only one block away from the Las Vegas Strip, you’re far enough away from the action where you and your family can enjoy some peace and quiet, but close enough for you and your friends to embark on some wonderful nighttime adventures. There’s no better place to be for exquisite dining, fantastic shopping, big laughs, and out-of-this-world entertainment than Las Vegas. Catch some world-class performers and live shows, try your luck at the plentiful Las Vegas casinos, and get your fill of the Fremont Street Experience. The Desert Club Las Vegas Resort offers a complimentary shuttle to take you to all the best stops on the Strip! But Holiday Inn Club Vacations at Desert Club Resort Las Vegas is more than just a convenient place to crash; it also offers an incredible vacation experience unlike any other. Enjoy paradise in the resort’s one- or two-bedroom villa with modern amenities and luxurious features. The villas feature a fully equipped kitchen, your own private bathroom, and a spacious living room complete with a fireplace, flat screen TV and premium channels. The modern aesthetic of the unit features granite counter tops and marble bathrooms to really let guests feel like they’re living in luxury. Start and end every great day in Las Vegas at these finely-appointed villas! Want more information about this one-of-a-kind resort? Call our Holiday Inn Club Vacations at Desert Club Resort timeshare resale specialists at 1-877-815-4227 or fill out the form on the right. You’re one step away from purchasing your dream home-away-from-home. 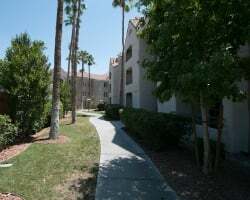 With a Holiday Inn Club Vacations Desert Club Resort timeshare resale, you avoid all the red tape of dealing with the developer directly, and you also avoid having to pay any unnecessary hidden fees. All of our Holiday Inn Club Vacations Las Vegas Desert Club Resort timeshares are for-sale-by-owner, meaning that you could save up to 70% off the retail price. You can save thousands of dollars without sacrificing quality of ownership. You have plenty of options when purchasing your Holiday Inn Club Vacations Desert Club Resort. Ownership comes in the form of deeded fixed or floating weeks. Owners can vacation during the same week year-after-year or they can choose any available week in any season, including White, Red, and Blue. You also have the option of vacationing annually or biennially. Desert Club Resort is part of the Holiday Inn Club Vacations catalog, a collection of resorts renowned for their respectable attention to guest services and gorgeous properties. Affiliated with InterContinental Hotels Group, the largest hotel company in the world, Holiday Inn Club Vacations shows excellence in providing family-friendly accommodations, modern amenities, and best of all, affordable lodging for all of its guests. Enjoy all of these wonderful luxuries at unbeatable prices. Read up on Holiday Inn fees associated with ownership, and find out how to reserve a stay at your resort. Travel to dozens of countries all over the world without compromising your timeshare ownership. Holiday Inn Club Vacations at Desert Club Resort owners can become members of RCI, the resort’s affiliated external timeshare exchange program. For an additional fee, you can access over 7,000 resorts from many different brands for a one-time vacation. Because of the wonderful reviews left by guests of the resort, along with the high-quality accommodations, Desert Club Resort Las Vegas owners will have high trading power in the exchange program courtesy of its “RCI Gold Crown" rating. 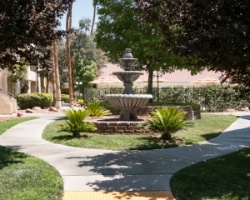 A number of the amenities on-site at the Holiday Inn Club Vacations Desert Club Resort are newly renovated. Walk in to the Clubhouse check-in lobby and your kids won’t be able to help but pine for the new game room and activity center. The updated fitness center provides a great workout experience for those looking to stay in their routines. Enjoy breakfast, lunch, dinner, and specialty cocktails all throughout the day at the poolside Gold Mine Bar & Grill. 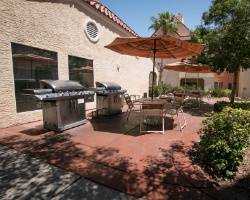 The resort hosts five heated pools and hot tubs, plenty of poolside grilling stations around the resort campus, and even hosts a putting green for those looking to take a quick breather from the Las Vegas excitement. Soak up some of that warm sun in the pool side cabanas and watch the tall palm trees sway with the nice breeze of the Vegas desert. Don’t miss a moment of the action at the Holiday Inn Club Vacations at Desert Club Resort. 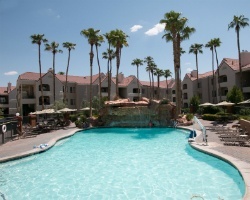 Already Own at Holiday Inn Club Vacations Desert Club Resort?